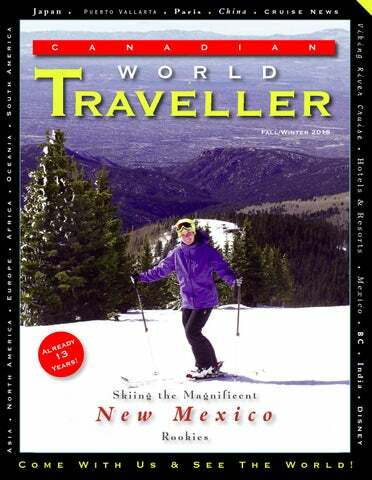 Welcome to Canadian World Traveller n this issue we start our tour with skiing in the amazing and overlooked New Mexico Rockies. While in the Americas, we head south to Orlando for a very Disney Christmas. We then journey to Asia to visit the delightfully mysterious area of Koyasan, Japan, take time for a fairy-tale trip through the province of Shanxi, China and discover the Rich & Colourful history in India. In our â&#x20AC;&#x2DC;Around the Worldâ&#x20AC;&#x2122; section we take short trips of discovery to Anguilla, Vermont, Alabama, Nanning-China, The Cook Islands, Puerto Vallarta, Rwanda, Isan-Thailand, Turkey and Paris. Cruise anyone? In our Cruising section we discover the many new offerings from the leaders in the cruise industry, find out The 10 Most Popular Cruise Ships and finally partake in a wonderful river cruise on the Romantic Danube with Viking River Cruises. In our Stay & Play section, we have sweet-dreams all around the world and especially at the Napoleon Hotel Paris, Dreams Resorts Mexico and at the Mountain Trek Resorts in B.C. Happy Travels! Michael Morcos Greg James Contributing Editor David J. Cox Graphic Artist Al Cheong Advertising Leo Santini Marketing Tania Tassone Distribution Royce Dillon Contributors: Susan Campbell, Natalie Ayotte Steve Gillick, Jennifer Merrick & Dave Cox Front Cover Photo by Michael Morcos: Ski Santa Fe Resort, New Mexico Disclaimer: Canadian World Traveller has made every effort to verify that the information provided in this publication is as accurate as possible. However, we accept no responsibility for any loss, injury, or inconvenience sustained by anyone resulting from the information contained herein nor for any information provided by our advertisers. ften over-shadowed by the Rocky Mountains in neighboring Colorado, the skiing adventures available in the New Mexico portion offer some of the best skiing in North America! great place to start off from, especially considering the filling and delicious supper we enjoyed the first night at La Fonda on the Plaza, a historic building and one of the better hotels in town. Modern day Santa Fe has also received a mention of distinction by becoming the first U.S. city to be chosen by UNESCO as a â&#x20AC;&#x2DC;Creative Cityâ&#x20AC;&#x2122;, one of only nine cities in the world to hold this designation! Ski Santa Fe The next day, my party and three others started out on four days of unforgettable skiing in the New Mexico Rockies, where we would ski at three different ski hills. Each one has a unique and local flavor and are the economic hubs of their communities. 10 where you can find a great tortilla soup to warm up and also enjoy the local Santa Fe Brewing Company beer on tap. The vibe in the Lodge is as laid back as the folks in the town, but the skiers are serious! For those who enjoy cross-country skiing and snow shoeing, the area is a paradise with well marked and easy to find trails. After skiing at Ski Santa Fe, we were offered a really wonderful and unexpected treat, a visit to a Japanese heath spa. It was a little peculiar as it is not something you would think of in the far Southwestern USA, but it was a real pleasure to soak in a hot tub with mountain scenery all round. After relaxing, we enjoyed a small snack in the Spa’s authentic Japanese restaurant. That night we went to eat at a local favorite hotspot, American Cowgirl, an absolutely delightful restaurant where cowgirls in hats and boots serve guests. Often considered the best BBQ in the city, you can expect excellent local music on the outdoor patio. They have a great selection of beers and superb cocktails and an amazing menu, including some delicious Chile Rellenos and one of the best pork sandwiches I have ever eaten! Another unique experience we enjoyed was a true ‘taste’ of the American Wild West at the Santa Fe Spirits. For a small place, it packs a mighty wallop! Offering tasters of their home-made, locally-sourced apple brandy, white whiskey (sort of tastes like tequila), smoked whiskey, vodka, gin, and great grain whiskeys, all were delicious and smooth tasting. If you can, try to take the tour of the distillery, as the machine is beautiful and learning about this start-up's process is quite inspiring too. For me, I enjoyed a nice whiskey sour that went down well as a toast to end our two day stay and ski in Santa Fe. Red River Each ski area offers a blend of activities for visitors both on and off the mountain. During the visit to each local, you can enjoy private instruction, skiing or boarding with an expert mountain guide or exploring the mountain on your own. Snowshoeing and cross country are other options to pursue. The Red River community is located far from civilization and has inviting, friendly locals who understand the appeal to worldwide skiers. Red River is a real ski town, and prides itself on being one of the most family friendly ski areas in the US and love welcoming kids! For us, upon arrival, a ski grooming tracker modified for passengers took us all the way to the top for supper at ‘The Tip’ mountain top restaurant was a great thrill. The Chef was very quirky and served us some amazing dishes. After dinner he would race us down the hill, beating us by a mile as the tracker was much slower. Skiing time! Conveniently, two out of six chairlifts leave from just a short stroll from Red River’s Main Street. There is a nice place for children to ski on their own, and for the more seasoned skiers, the main ski lift goes up about 10,000 feet on a beautiful and peaceful ride. Snow on the trees shone in the sunlight like a mountain of clear crystals, making the ski day a magical and hypnotic one. This area has just the right mix of challenges and kid friendly fun slopes. The runs are well manicured and the staff was very helpful. Downtime was spent walking around the village, which has just the right amount of recreation, shopping and leisure activities. After the skiing, our guide highly recommended and took us to St. Bernards for an après ski drink. The owner Jean Mayer and his staff have created a home away from home for their guests. Here we rubbed shoulders with fellow skiers and instructors. As we were just there for a quick drink, we were invited back to stay at this wonderful hotel and restaurant at the foot of the mountain. I took a platter of Sauerbraten and enjoyed every bite…the Bavarian was another unexpected treat in New Mexico! New Mexico was good food, great folks, and amazing skiing! The mountain itself has something for everyone, from challenging, steep runs spread all over the ski area, to many other tracks that can accommodate all skill levels. I did notice something else really great, that there were rarely any waiting in lift lines! Great snow conditions and everything you could want! For our last evening of the trip, we were treated to a great dinner at The Bavarian restaurant with typical Bavarian fare, all set in a chalet constructed just like an authentic German Cabin. The gourmet menu features sophisticated and hearty German dishes, including such traditional food as Sauerbraten, Wienerschnitzel, or Käsespätzle, with twinned wine or specially imported beers from the Spaten Brewery in Munich. American staples are also available, including salads, sandwiches, and burgers. I was amazed just how good the ski school was as they helped to prepare us for Kachina Peak. It is also like having a guide personally show you around the mountain. I can think of no better place for beginners to come to learn. Our resort offered us new and very modern rooms that are, well decorated and offered a balcony with an amazing view. The amenities, staff and service were all top notch and it was a great stay. Fortuitous timing had us, well, the most daring and advanced among us at least, able to enjoy one of the biggest events in North American skiing this year - skiing the Taos Ski Valley Mountain’s celebrated Kachina Peak via a chairlift! The Kachina Peak Lift climbs to 12,450 feet, making it one of the highest chairlifts in North America and has increased the mountain’s advanced and expert lift-serviced terrain by 50 percent. ing and low key. The Town of Taos has interesting architecture, great shopping and delicious dining. Influences are numerous and from many places, including Spanish, Indian and Mexican that make the town different than most others in the United States. Japan Article & Photography by Steve Gillick n Japanese mythology, the word ‘Hannya’ refers to a female serpentdemon filled with hatred and jealousy. Hannya masks are featured in many traditional Noh Theatre plays where they take on the appearance of devils, with two sharp horns, leering eyes and a gaping mouth filled with fangs. Interestingly enough, ‘Hannya’ means wisdom. Yet in Koyasan, we learned a whole new intoxicating meaning of the term. brought an amazing vegetarian feast to our room and asked what we wanted to drink. Taking advantage of his personable nature, and knowing that alcohol was not permitted, we joked about ordering sake. He looked at us seriously and said that sake was not allowed, but then breaking into a smile he suggested that we could order ‘Hannya-to’. In response to our quizzical looks, he explained that ‘Hannya –to’ was in fact, sake! of hot sake mixed with salt each day, in order to help them tolerate the harsh life in the mountains, especially during the winter season. The drink was said to warm the body and engender wisdom with the belief that sake itself was the very source of wisdom. So while alcoholic drinks per se were not allowed, ‘Hannya –to’ was! And to help us appreciate our temple surroundings, reflect on the tranquility of the private Zen garden outside our room, savour the amazing vegetarian dishes before us, and drink in the spirituality of our surroundings in Koyasan, we drank Hannya-to. And it worked! Koyasan has long stood as a legendary “must see” for back packers and as well as over one million pilgrims each year. In 2004, UNESCO listed Koyasan as a World Heritage Site; part of the ‘Sacred Sites and Pilgrimage Routes in the Kii Mountain Range’. At the present time there are 123 temples that offer encounters with serenity, reflection, meditation and peace of mind. Most travellers depart for Koyasan on the 90-minute train ride from Osaka. They arrive at the Hashimoto station where they board an incline cable car for the 3000 foot ascent, past 10 station stops, to Koyasan. From there a local bus takes visitors on a 10-minute drive into town. We chose the Jimyoin after researching many of the 52 temple lodgings and we were more than pleased with our decision. On arrival we were greeted by one of the monks who instructed us to place our shoes in a cupboard, don slippers and follow him down the long, twisting corridor to our room. On the way we were told when we could use the ‘bath’ room (similar to a hot bath/hot tub); informed that dinner would be served in our room at 6:00 pm, and invited to participate in morning prayers at 6:00 am. Our room was beyond expectation. It was a large, traditional washitsu –a Japanese room with tatami mats on the floor—filled with antiques, drawings and kakejiku (hanging scrolls of painted scenery). A small alcove overlooked our very own Zen garden. We decided to put our awe on hold for the time being and explore the town. Across the street from the Jimyoin was a Burmese Temple, where calm statues of the Buddha sat next to horrific depictions of life in the underworld. It was a graphic reminder that throughout the centuries, the role of the priest was to instruct worshippers, many of whom were illiterate, on how to live a righteous life, and remind them in words and illustrations of the consequences of not respecting the teachings of the Buddha. Other temples along the two main streets and connecting side streets were also characterized by moralistic architecture and design. Tucked under temple roofs were carvings of Baku (mythological beasts with the trunk and tusks of an elephant, the eyes of a rhinoceros, the paws of a tiger and the tail of an ox), Shishi (fierce, growling doglions) and angry looking Dragons, all of which served to dissuade evil spirits from entering the holy realm of the temple while at the same time serving to bring good fortune to those who came to pray. his ascent to ‘eternal meditation’. And standing outside many temple gates were the Nio guardian statues: Tall, scary, scowling gods, one with mouth open (Angyo) symbolizing birth and the beginning of all things, and the other, with mouth closed (Ungyo) signifying death and the end of all things. Their chilling expressions ward off evil and protect all who enter the temple grounds. Other major attractions in Koyasan include the elaborately ornate mausoleums commemorating the great Shogun Ieyasu Tokugawa (the founder of the dynasty that lasted from 1608 to 1863) and his son, Hidetada. And nearby, the Reihokan Museum contains priceless religious statues and treasures, many of which are designated as national cultural assets. The cemetery in Koyasan lies to the northeast and is accessible by foot or bus. It’s a fascinating and mysterious world of simple tombstones, elaborate corporate memorials (including a rocket ship) and hundreds of peaceful looking Jizo (the Boddhisattva seen as the protector of travellers, women and children) dressed in traditional red hats and capes. The main pathway leads to The Great Forest of Japanese Cedar, a collection of towering trees, some 600 years old and 165 feet high, that stand guard over the moss-covered Japanese lanterns, torii gates and headstones below. And just beyond lies the Ichinohashi Bridge that pilgrims cross to reach the Okunoin, the solemn, sacred memorial to Koyasan’s founder, Kobo Daishi. Entranced by the whole experience, we returned to the Jimyoin for a soothing hot bath and then an incredibly delectable vegetarian meal. Dishes included grilled tofu with miso, bamboo shoots and shitake mushroom with dry tofu, grilled fresh mountain vegetables, delicately battered vegetable tempura, velvety smooth sesame tofu (one of the specialties of Koyasan), along with tasty miso soup and fresh steamed rice. And of course our Hannya-to only heightened the culinary experience. At 6:00 am the next morning, we joined other pilgrims for the 30-minute prayer service and then after a simple but delicious breakfast we enjoyed one last wander around town. Then it was back to the cable car and the descent to the hustle-bustle of big city noise and traffic. Koyasan is a breath of fresh air, a shot of tranquility, a peaceful sojourn into respect, patience, beauty, relaxation and soul searching. It ranks high as a destination where ‘chilling’ is the order of the day. A n n i e Po tt s a n d K e m a r e ly nguilla’s Arijah Foundation and the Blossom Centre dedicated to helping the island’s special needs children received a welcome boost from regular visitor Annie Potts. Inspired by the spirit of Kemarley Brooks- a local boy with special needs Annie met on the beach, she decided to fulfill her lifelong dream of writing and illustrating a children’s book. The result: “Kemarley of Anguilla”- a beautiful story that shows the world his unique perspective on his island home. It’s available on amazon.com, and all proceeds go to the Arijah foundation. Ex-pat Canadian Renuka Harrigan is the founder of Arijah, named after her own daughter with special needs. She says, “We are so blessed to have so many angels on Anguilla- locals and visitors alike- to help us help our children blossom and grow here. And we want to thank Annie and her husband James for being such a great support for our cause for so many years.” You can help, too. Donations are accepted on site, or if you are visiting the lovely island of Anguilla, the center is always happy to welcome volunteers and is always in need of school supplies and basics. deal snow conditions contributed to a record-breaking season for the Vermont ski industry last year with a whopping 4, 670,903 skier and rider visits. Our family was among them, vacationing at these top resorts. new global brand logo. With an overall look as a stamp, the new logo integrates modern messaging with the ancient Chinese art form of calligraphy. The hieroglyph in the background means “travel” in ancient Chinese language, which shows a flag guiding a couple around. The blue color represents the sky, delivering China tourism’s concepts - vitality, harmony and green travel. The red color gives tribute to the Chinese civilization that has been going on for thousands of years. Illustrating an international vision, the “Beautiful China” logo represents China’s promising and welcoming tourism industry. ocated on the Gulf of Mexico at the state’s southernmost point, Alabama’s Gulf Shores has everything vacationers could wish for in a beach vacation - -white sands, friendly people, succulent seafood and plenty of recreational enjoyments. ith just one click, it is now easier than ever for travelers to get the latest information about the Cook Islands and view enticing videos of this idyllic South Pacific paradise with the launch of Cook Islands Tourism North America’s engaging new website, www.paradiseincookislands.com. "Paradise is within easy reach, and the new website is a 'one-stop' resource to tap into valuable facts about a pristine South Pacific destination that is still largely undiscovered by Americans,” says General Manager of Cook Islands Tourism North America, John Petersen. The new website provides in-depth profiles of Rarotonga, an all in one easily accessible island resort, and the must-see Aitutaki, named "the most beautiful island in the world," by Founder of the Lonely Planet Guidebook, Tony Wheeler. The site also describes a vibrant contemporary Polynesian culture, highlights top reasons to visit the Cook Islands and “top 10 things to do." It also features links to “Explore;” “Stay;” “Activities;” “Dining;” the site’s new “Blog;” and “Specials” with an array of exciting air and land packages; and options for transportation within this unique nation of many islands. ush is the best word when describing the wonderful city of Nanning, China! The area’s warm climate gives it a large amount of animals and more than 3,000 species of plants. The city has many gardens and woods, with Jaba flowers and Almond trees as the symbols of this green metropolis. Its major attraction has to be Qing Xiu Shan Scenic Spot, an immense and beautiful city park with many activities including feeding the koi fish, discovering the rich and diverse gardens or viewing the impressive array of amazing sculptures throughout the grounds. The tourist tram is a convenient and great way to get around here. The park boasts a "mountain", but it is more of a large hill, and getting to the top is a wonderful hike which passes through orchid gardens, peach blossom islands and a temple. Once up top, the view is splendid as the modern skyscrapers blend into the greenery to create a wonderful picture of modern China. The Guangxi Museum of Nationalities boasts an incredible collection of traditional tools, instruments and jewelry, including some pieces dating back some 2000 years! Used in many local rituals, the Bronze drum has a very sacred place in the hearts of the local peoples, and the collection here is quite impressive. ‘Colourful Guangxi’ is a Cultural Exhibition that introduces the traditions of the twelve native nationalities in Guangxi. There is also the Guangxi Ethnic Silver Accessory Exhibition, with 200 specially chosen silver items from throughout the history of the region. Coupled with the `Weaving, Dyeing & Embroidering Exhibition`, a full spectrum of Nanning and surrounds can be experienced through these treasures! After a day of exploration, you will enjoy Nanning`s `Night Markets`, in which a million different items, foodstuffs, drinks and find just about anything else you could imagine can be found and bought! he first time I heard of this wonderfully accommodating Mexican town was during the 1970’s Love Boat show, where the Pacific Princess, a cruise ship, traveled between Los Angeles and Puerto Vallarta. Visiting the actual town in person provides visitors with a delicious mix of beautiful beaches, wonderful attractions, exotic flavors and scintillating smells! Though still tourist-centric, Puerto Vallarta has kept an old Mexico feel and is very laid back, with friendly locals and street vendors who know how to welcome visitors! Of course, as with most southern destinations, the main draw is the beautiful beaches. Many different adventures await the visitors on this city’s paradise-like beaches, including horseback riding along the waterfront, going for long swims in the warm water, shopping at some of the many boardwalk stores or enjoying sunbathing on one of the many long, sandy beaches within the city limits. My personal favorite beach lay at the foot of the lush, tropical mountains, where the deep greens of the mountains blend into the white sand, and the blue sky connects with the azure water. I have that image burned into my memory and think of it often. other amazing, rich and refreshing offerings. Visitors are treated to unique gourmet meals as unique as the surroundings. The Twisted Palms rooftop lounge is a nice little spot to enjoy delicious martinis and other cocktails, with the added bonus of having great movies projected on the far wall of the lounge. Theme nights, like James Bond Night Martinis, are a regular occurrence. A lot of fun! Food is a object of pride in this part of the world, and the city offers a fun tourist adventure that is a must for all families and visitors, the Taco tour! This tour is a visit to seven different restaurants and street food-stalls to taste the many different styles of Tacos from around the city. The hours-long tour also offers a local’s view into Mexican culture through its cuisine and rich history. Most tours are family-friendly, but our group of adults stopped at a bar for a nice Mescal drink. It was a wonderful four hours with a great guide and we learnt plenty about Mexico's favourite food and the city. Speaking of adult-oriented experiences, a visit to the Viva Tequila Experience, is not only a , wonderful way to learn about Tequila but enjoy a night of friendship with lots of samples and a great Mexican dance show at the end! ore than 20 years have passed and Rwanda, a small country of only 27 000 km2 in the heart of Africa, is healing and trying to rejoin the rest of the world as a destination location. Though not a destination one would think of right away, Rwanda is now a warm and friendly place to visit. Surrounded by the Democratic Republic of the Congo (RDC), Burundi, Tanzania and Uganda, Rwanda’s African roots are evident as soon as you arrive. The country is a strikingly beautiful place, and has a marked cleanliness that will impress the fussiest visitor. Imagine: plastic bags have been banished from the country since 2008! Present day Rwanda offers tourists a secure and well organized country to visit. The capital, Kigali, is a modern and dynamic city offering everything a traveller could ask for. Numerous restaurants allow visitors to savor the local flavors and specialties, coffee shops where you can appreciate home-grown Rwandan coffee and teas that are now recognized internationally, visit art galleries and take advantage of the booming night life. Luckily, the strife faced by this lovely country managed to exclude the main tourist attraction, the mountain gorillas in the Volcanoes National Park. These creatures are treasures and quite celebrated, including an annual ceremony, Kwita Izina, which is organized to give names to baby gorillas born during the year. But these animals are not the only attraction! This country, known as the land of a thousand hills, also offers Akagera National Park and allows you to see numerous animals such as giraffes, zebras, elephants and quite recently lions were reintroduced. In Nyungwe National park, it is possible to observe birds, to visit with chimpanzees and hike through tea fields and a majestic forest. The Congo Nile Trail is 227 km long and follows the shoreline of Lake Kivu between the cities of Rubavu, Karongi and Rusizi. Most adventurers can travel it in 5 days by bike or in 10 days by hiking. ext time in Thailand, head northeast to Isan for a unique experience in a region influenced by the mingling of cultures from Thailand, Laos, Cambodia and Vietnam, characterized by big cities, fascinating small villages, fantastic markets, Khmer ruins, gorgeous temples, ultra-friendly people and fresh, delicious food. We did a circle route by van, starting with the ‘market’ train at Prapong that travels to the Kabinburi Market, a photographer’s paradise showcasing incredible edibles from rats, crickets, fish and crab to rambutan, mangoes and cilantro. In Nahkon Ratchasima, the 12th century Khmer Temple known as Prasat Hin Pimai, was considered to be the model for Angkor Wat. Nearby, learn about silk weaving in Bang Song Village, feed the hundreds of turtles in Ban Kok to honour the protective village spirits, and chat with the grass mat weavers in the village of Koo Kaew. At Wat Sirisutho, known as the gateway to the underwater world, follow the serpent bridge to the colourful Naga temple and then visit the Ban Chiang Archeological Site for ruins and pottery dating back to 2000 BC. Continuing on to Nakorn Phanom, take the Mekong River ‘booze’ cruise with Laos only a stone’s throw away, and then head to Mekong Walking Street, a colourful night market with foods, crafts and music. The adventure continues at Sam Pun Bok (3000 holes), known as Thailand’s Grand Canyon, and then wander through Pha Taem National Park in Khong Jiam, complete with cliff paintings and the unbelievable mushroom rocks at Sao Chaling. And throughout the entire region there are city and forest temples, both elaborate and simple, for spiritual regeneration. Isan represents one of Thailand’s fastest growing economies but remains mostly undiscovered by travellers. 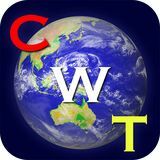 It’s ideal for those looking for that ‘what else’ to discover on their global journeys. For those who are interested in history, six national museums situated in the cities of Kigali, Huye, Nyanza and Karongi as well as the memorial sites of Gisozi, Nyamata and Ntarama, explain the origins of the nation, the colonial period, independence, the terrible 100 days of the genocide and the return of peace to this small country which has big aspirations for the future. Rwanda is a treasure hidden in the heart of Africa and its beauty will stay with you always! he ancient beauty of Turkey’s archaeological ruins and pristine landscape have been recognized as among the best in the world this past summer with two new historic sites added to the respected UNESCO World Heritage list, and 53 new beaches added to the exclusive “Blue Flag” eco-label. The ancient city of Ephesus, Diyarbakır Fortress and the Hevsel Gardens Cultural Landscape have been added to the UNESCO World Heritage List for their outstanding universal value and cultural and natural significance. With 15 sites now on the list, Turkey will host UNESCO’s 2016 World Heritage Committee meeting. The quality of Turkish beaches, meanwhile, has propelled the country ahead of Greece to rank second in the world for the number of beaches certified “Blue Wave” by the Foundation for Environmental Education for water quality, environmental management and safety. Turkey now has 436 “Blue Flag” beaches, placing it behind only Spain in the top 50 countries on the exclusive list. Turkey brings together the best of the world’s heritage and nature with rare sites that have archaeological ruins alongside the sands of Mediterranean and Aegean beaches, such as the ancient city of Phaselis near Antalya, or the world’s oldest lighthouse on Patara Beach. Coupled with new ways to fly to Turkey and new places to stay once in the country, the ancient beauty and natural landscapes make it an inimitable time to join the 41 million travelers visiting the 6th ranked tourism destination in the world. at Christmas Article & Photography by Michael Morcos alike. The Galeries Printemps and Lafayette also offer lighting displays that will take your breath away! Paris is filled with surprises and unique offerings for its citizens and visitors. A personal favourite is the surprise on the first level of the Eiffel Tower - Paris' highest ice-skating rink! The view is as spectacular as one can imagine, with the frosted windows and snowcovered domes reflecting the lights of the city. The Hotel de Ville has also built an annual rink for the people to enjoy, and though charming in its own right, the Eiffel Tower’s rink is something else! No trip to Paris would be complete without shopping! A Parisian staple for sure is chocolate. With so many boutiques to choose from, the artistry of Patrick Roger has to be at the top of my list. White chocolate icicles and giant chocolate trees bring the magic of Christmas to the ‘sweet toothed’ of the world! Over Christmas, the City of Lights truly lives up to its name and reputation with a million twinkling, blinking, colorful lights welcoming guests and residences alike! As one of the oldest wooden structures in the country, the Jinci Temple (Jin Ancestral Temple) is a combination of historical and cultural relics located within a beautiful landscape. The Chinese have made a name for themselves with spectacular displays of choreography, light and music. The Olympic Games in Beijing showed the world the prowess of the countryâ&#x20AC;&#x2122;s festive nature! The Qiao Family Courtyard is another masterpiece of traditional civil architecture, and was the house of the well-know financier Qiao Zhiyong of Qing Dynasty and the compound has been turned into a magnificent complex for visitors. The multitude of ancient trees provides an eye-catching entrance to welcome visitors, and the majesty continues throughout the vaulted halls, cabinets, pavilions and bridges. The Temple is renowned because it is an ancient ancestral temple, something which is quite rare in China. There are also nearly three hundred tablets inscribed with writings by emperors, officials and poets lining a scenic path in the temple. Dances and lively music dates back to the Tang Dynasty and there are many different shows to enjoy. The productions include numerous costume changes, historic musical instruments, professional singing and dancing. The shows really have it all, with nonstop lights, sounds and colours! The dancers are exceptional and trained to perfection, seamlessly running through their dance sequences. Some of the shows include dinners, much like in north America, but with a Chinese flair! Qiao Family Compound has 6 large yards and 20 small yards including 313 houses. It was built so that when you look down at the overall yard above ground that looks just like" ĺ&#x2013;&#x153;ĺ&#x2013;&#x153;" (double happiness in Chinese)! From the outside, the straight stone pavement divides into 6 courtyards and the Qiao family's ancestral temple directly faces the gate. There are 4 main buildings and 6 other structures including the Geng and Tiao pavilions. The sidewalks on the roof of every yard are connected to allow for a great stroll above the yards. The doors, windows, eaves, and stone stairs are all beautifully shaped. Brick carvings are everywhere in the yards and are based on figures, flowers and plants, birds, painting and calligraphy and are exquisite for their workmanship and quality is second to none. There is also a Folk Museum that features art, science, and more, and has 42 exhibition rooms displaying a wide range of material covering the history, food, clothing, and transportation, wedding and funeral ceremonies, and agriculture trade activities of the area. More than 2,000 pieces reflect the folktale custom of the Shanxi Jinzhong area. The City of Pingyao The city is famous for the immense wall and the main attraction is the city itself. A walkabout will astound the history buff, as nearly every building dates from the Ming (13681644) or Qing (1644-1911) Dynasties. Making it even better is the car-free status and ancient street plan that make it easy to enjoy a stroll and adds to the ancient atmosphere. The wall of the city is a treasure of its own, and is shaped like a tortoise--a traditional Chinese symbol of longevity--with the south gate and north gate representing the head and tail respectively. It is over 600 years old and has a series of 72 watchtowers and a moat. The Rishengchang Exchange House was developed as an answer to the dangers experienced along the extensive trade routes. As Pingyao is at the centre of these trade routes, and in 1823 the first piaohao ("exchange house", "draft bank," or "remittance shop") was opened to provide remittance services, accept deposits, and make loans. As a result, the Rishengchang, or "Sunrise Prosperity," was the first exchange house and soon Pingyao became the center of the nation's banking industry. Rishengchang survied for 108 years before collapsing in 1932, and the historical societies have refurbished a number of other piaohao buildings and opened them to tourists. The Hongshanyi guest house This beautiful old fashioned style guesthouse/hotel has been lovingly restored and offers ancient courtyards, and though the rooms are on the small side, the service and location are perfect. Located just off the Main Street, access to the tourist and shopping areas is just a doorway away and guests can hear the karaoke music and loud nightlife that can have you enjoying and exploring deep into the night! Mt. Wutai Considered as the most holy land of Chinese Buddhism, Mt. Wutai offers beautiful scenery and is a true masterpiece of nature. Besides the religious aspect, visitors can explore the peaks and valleys, passing through clouds on the way up and enjoying the sunset. The natural beauty of the mountain ridges, exotic rocks, gullies, clear waters and green forests makes it easy to see why the mountain is a colorful and notable scenic resort! Buddhist Temples It is said that this mountain is where Manjusri Bodhisattva resides and over 360 temples were built here, with some dating back to the Tang Dynasty (618-907). Sadly only 47 of them remain, yet untold numbers of pilgrims and visitors have visited these magical spaces. Among these magnificent temples, there are four that stand out. Oldest and most prestigious among these is the Xiantong Temple, a palace of 80,000 square meters and build in the year 68! Today it is one of the most important temples as the Buddhist Association of Mt. Wutai calls it home. The copper bell in front of the gate is the biggest bell on the mountain, weighing over 22,000 pounds and it can be heard around the entire mountain. Datong The Hanging Temple was built in 491 and has survived more than 1400 years. Its uniqueness has brought construction experts from around the world come to see the monastery. Hanging from the side of a mountain, it mixes mechanics and aesthetics, and symbolizes the great architectural achievements of Chinese people. Yingxian Wooden Pagoda features hidden floors and windows that offer views from all 8 sides of the building up to 30 kms on a clear day. There are also zaojings carved into the ceiling of every story of the pagoda. The Huayan Monastery complex is located on Daxi Street on the south western side of Datong City and is the largest and most well preserved monastery of the Liao Dynasty in existence in China. It is small and intimate, and a lovely place to meditate and view some history. Lastly the Yunggang Caves were built in northern Wei Dynasty 1,500 years ago and are called â&#x20AC;&#x2DC;The Art Treasure of Eastern Caves and is very famous for its wonderful stone carvings. The Yungang Grottoes, have 252 caves and 51,000 statues, represent the outstanding achievement of Buddhist cave art in China and constitute a classical masterpiece of the first peak of Chinese Buddhist art. Myella Farm Stay (Australia): Ever wanted to experience life on a 2,500 acre cattle station? Saddle up for a taste of the real Australia in the remote outback. Milk your first cow, meet the local farmers and then find the right spot for a perfect outback sunset. Sleeping in the Sahara Desert (Morocco): Trade traditional accommodation in the Moroccan city limits for the comforts of the world’s largest desert. Blast across sand flats and wind between the desert dunes to before arriving at the small village where you can pre-arrange to spend a night with a local family. La Tomatina Festival (Spain): Everyone loves a good food fight, so why not join 20,000 people playing with 40 metric tonnes of tomatoes in the world’s biggest vegetable skirmish. La Tomatina is a perfectly valid excuse to dance in the streets and drink sangria at 11am with cool people from all over the world. Jaw Dropping Scenery in the Swiss Alps (Switzerland): Visit the Swiss Alps and you'll find vistas and landscapes that seem almost too perfect to be real. Snowcapped mountain peaks, deep valleys, pine forests, rolling meadows, running rivers, medieval cities and quaint villages... it's postcard worthy stuff. Sailing on the Nile (Egypt): While it may seem cliché, there is nothing like seeing Egypt from the Nile River. Cruise the famous river and explore ancient Egyptian ruins on a traditional, wooden felucca sailboat for that historical and authentic feel. Traditional Turkish Family Dinner (Turkey): After a day of exploring the ancient ruins, stunning landscapes and fascinating culture of Turkey, find a local family willing to prepare a home cooked Turkish meal so you can dine like a local. Thermal Baths in Budapest (Hungary): There are more than 80 thermal springs in Budapest but the Art Nouveau style Gellert Baths are the city’s most famous. Take to the waters, relax, and don’t leave until you’re pruny. Haggling in a Marrakech Medina (Morocco): Lose yourself in the winding passageways of the Marrakech Medina surrounded by scores of stalls selling a wide array of Moroccan fare. See something you like? Be prepared to bargain for your prize, because in Morocco, the truth is that haggling is simply the name of the game. Midnight Sun (Norway): Cross the Arctic Circle into the Land of the Midnight Sun and experience a day unlike any other at the northernmost tip of Norway. Think of all the sights you could see with 24 hours of daylight! Las Fallas in Valencia (Spain): Watch the hometown of paella go up in smoke during one of the wildest street festivals on the European calendar. Neighbours unite to produce naughty effigies, colossal bonfires and amazing parties in the streets – Las Fallas is fiery festival of ferocious proportions! SEABOURN ENCORE In 2016, Seabourn will introduce Seabourn Encore. The new ship is as strikingly beautiful and as excitingly innovative as any Seabourn has ever debuted. It will crown a fleet that is already the newest, most modern and most acclaimed in the ultra-luxury segment. Modeled on the award-winning trio of ships introduced with Seabourn Odyssey in 2009, Seabourn Encore represents another welcome stage in the evolution of small-ship cruising, which Seabourn pioneered and has consistently expanded and enriched. An additional sister-ship, Seabourn Ovation, is scheduled for delivery in 2018. Both sisters will deliver a wealth of new concepts, a fresh vision and a host of illuminating ideas to delight the worldâ&#x20AC;&#x2122;s most discerning travelers. Luxury expedition cruise line Silversea has announced the launch of Grand Expeditions. Sailing from October 2015, Silversea has created five epic, oncein-a-lifetime combined voyages, each offering guests a unique experience from sea, to land, to sea again. Ranging from 18 to 34 days, the Grand Expeditions will begin with an expedition cruise in the GalapĂĄgos Islands, before connecting to a land adventure, and finally ending with a further expedition cruise exploring the coast of Central America, South America, or Antarctica. AQUA EXPEDITIONS UPGRADING BOTH AMAZON CRUISE SHIPS: AQUA AMAZON AND ARIA AMAZON Aqua Expeditions has announced new renovations to its two Peruvian Aqua Amazon vessels, the Aqua Amazon and the Aria Amazon. The upgrades are being overseen by the boats' original designer, renowned Peruvian architect Jordi Puig. "As the leader and pioneer of small ship luxury cruising on the Amazon and Mekong, we want our boats to always be top-of-the-line and at the forefront of guest comfort and experience," says Francesco Galli Zugaro, CEO and Founder of Aqua Expeditions. The vessels are being revamped head-totoe, with exteriors featuring new woodwork, painting and awnings. New wood flooring has been installed throughout most common areas; all suites are being redone with new floors, furniture and amenities, and bathrooms with new floors and tiles. CELESTYAL CRUISES LAUNCHES NEW ALL-INCLUSIVE CUBA CRUISE Cuba Cruise by Celestyal Cruises has announce a brand new all-inclusive cruise program featuring an unlimited bar & beverage package and a variety of rich shore excursions that showcase the real Cuba. Travelling aboard the 1,200passenger Celestyal Crystal on a stellar seven-day cruise, travellers will experience the best of Cuba with an in-depth stay in Havana and five other exceptional ports of call, including Cienfuegos, Maria La Gorda, Santiago de Cuba and Montego Bay, Jamaica. While on board the classic Celestyal Crystal, passengers will dine on authentic, freshly-prepared international and Cuban dishes and enjoy authentic Cuban entertainment. These incomparable all-inclusive packages begin at $1,299 CAD per person. With these upgrades, guests of Aqua Expeditions can experience a heightened level of Aria Amazon comfort on what were already the most luxurious boats on the Amazon, and the Aqua Amazon and Aria Amazon will continue to maintain their position as leaders in luxury small ship expeditions cruising. ms Koningsdam In summer 2016, Holland America Line’s newest ship, ms Koningsdam, will debut a series of northern Europe and Baltic cruises as part of the premium line’s robust Europe season that features seven ships sailing throughout the region. Following three Mediterranean sailings in April 2016, the ship will reposition from Civitavecchia (Rome), Italy, to its summer homeport of Amsterdam, the Netherlands. Koningsdam will then go on to sail roundtrip Amsterdam itineraries to Norway, the Baltic and Iceland, where breathtaking vistas and grand fjords await. Crystal Yacht Cruises – Late this year, Crystal Esprit will embark on its maiden voyage as the first expansion of the Crystal Cruises fleet. The vessel is an extravagantly appointed yacht and extensively redesigned to reflect the stylish elegance for which Crystal is renowned. The 62-guest, 3,000-tonnage yacht will offer intimate, exclusive, and immersive experiences with a boutique ambiance. Ocean Vessels: “Crystal Exclusive Class” – Crystal returns its focus to the seas, with three new “Crystal Exclusive Class,” polar ice class vessel cruise ships with the first expected for delivery in late 2018. Crystal Luxury Air – Also in 2017, Crystal’s brand of Six-Star luxury will soar to new heights with the launch of Crystal Luxury Air, becoming the first in the luxury travel industry to offer extravagant around-the-world trips on the world’s most advanced twin-aisle Boeing 787 Dreamliner. The plush aircraft, which typically seats 300, will fly 60 guests in fully reclining first class seats to coveted destinations to which major airlines do not offer nonstop service. Crystal River Cruises – The spring of 2017 brings more growth with Crystal River Cruises. Featuring expertly curated itineraries, Crystal River Cruises will offer the hallmarks of the all-inclusive Crystal experience – six-star service, world-class dining, and enriching shore-side adventures. Spacious suites with exquisitely designed interiors and elegant public rooms will punctuate Crystal’s entry into worldwide river cruising. Exactly 25 years after Crystal Cruises set its course as a leader in luxury cruising with the launch of the first of three ships, the world’s most awarded luxury cruise line is charting a new, much more vast, route and announced Crystal’s plans for the most significant brand expansion in the history of luxury travel and hospitality. Over the next three years, Crystal Cruises will introduce new ships – effectively establishing three brand new classes of cruising – as well as its own Boeing 787 Dreamliner aircraft. The ambitious timeline of new Crystal products begins at the end of 2015. Four new enrichment-filled programs that will take guests from the sun-soaked region of the Mediterranean to the cultural capital of St. Petersburg. Fresh off the christening of its first ship, the 930-passenger Viking Star®, Viking Ocean Cruises® has announced that four new itineraries and 2017 departures for Viking Star—and sister ships Viking Sea® and Viking Sky®—are now open for booking. The 2017 program includes sailings on Viking's most popular itineraries in the Mediterranean, Western Europe, Scandinavia and the Baltic. Viking's guests now have even more opportunities for destinationfocused cruises in 2016 and 2017 that span from ancient empires to the towering fjords of Norway and beyond. y husband and I have enjoyed spending our summer vacation for the last few years traveling across Europe, discovering charming cities by foot, car and train, but this year we would be trying something different… We would be spending our vacation aboard the prestigious and renowned Viking River Cruises for a 7 day journey along the Romantic Danube River through the Bavarian region of Germany, Austria and Hungary. which would be our home for the next 7 nights. After freshening up in our superb cabin, we joined the rest of the Viking guests in the ship’s lounge for cocktails and our welcome briefing with our Program Director Mario! and restful sleep – luxuriously magnificent! The crew is ready to please and will adapt to your personal need. English speaking, courteous and resourceful, you only but to ask and they will do everything to make your journey memorable…a special thank you to Demitri, our cabin attendant, who kept our cabin spotless and rewarded us with all sorts of personal services including replenishing our cabin with fresh fruits everyday ! immense variety of foods available, and even a chef ready to cook your favorite egg dish to suit your desire. Lunch on board is usually served between 12:00 and 2:00 pm in the restaurant section and is served either buffet-style or a la carte. Enjoy your meal with wine, beer or other beverages. tural charms of each city with a knowledgeable local guide provided exclusively by Viking River Cruise. There is no better way to discover the treasures of each city! There are optional tours available for guests who wish to extend their excursions, prices are reasonable and always include a return fair back to the boat. Dinner aboard the Viking takes place around 7:00 pm – the menu is usually inspired by the local favorites prepared with infinite care. The meals are arranged to perfection to please every guest on board. Dress code is casual, and there are no preset seating arrangements, so you can enjoy your meal with new friends every night! Daily briefing on board: During cocktail hour, all guests are welcome to join in a 15 minute briefing provided by the program director. It is a great time to unwind, relax and listen to the upcoming destination, activities and events. No worry if you miss a meeting, Viking provides its guests with a “Viking daily news bulletin” which summarizes the upcoming day’s activities. Nuremberg As our bus drove through Nuremberg, we could visibly see the transformation of various eras that survived the city. From the vestige Romanesque time (1050) we glimpsed remaining round arches set on pillars, then onto great Cathedrals and Abbeys built during the Gothic times, making way to harmonious and symmetrical architecture built through the renaissance, Baroque, Rococo and Neoclassical periods, ending our tour in the Art nouveau district of Nuremberg – what a magnificent city. We also enjoyed some free time to further explore the city on our own before heading back to our ship. Regensburg Another medieval jewel located in the Bavaria region of Germany that has much to offer its thousands of yearly visitors. It is the oldest city on the Danube and also one of the best-preserved towns in Europe that thankfully survived the devastating World War II bombings. Walking through the city with our well-informed guide, we passed through the old city gates built in Roman times still standing tall after 1800 years. I was most impressed by St-Peter’s Cathedral, a splendid historical building which dates back around 700 AD! While we tend to spend most of our time inside churches, I encourage you to stroll outside along the streets, and observe the numerous sculptures set in various biblical themes - it is an impressive historical monument to visit. Passau Welcome to the «city of three Rivers». Passau is connected to the Danube, Inn and Ilz rivers, and while part of Germany, it is but a few kilometers away from Austria. This little gem is known for its devastating floods. As we began our guided tour in the lower part of town, we could still see the effect that past floods had left on some buildings, particularly noticeable after the flood of 2013 where the water level reached heights of 20 meters. Walking through its narrow streets, you will come upon picturesque squares, soaring towers, and beautiful Baroque churches. We really enjoyed the old town city square center filled with small cafés, restaurants, and souvenir shop before continuing our tour. In the months of April to October, there are organ concerts at the St. Stephen’s Cathedral. For half an hour, we listened to music performed by the world’s largest cathedral organ. As I closed my eyes, I could hear the power of this17 974 organ pipes, 233 stops and four carillons organ – this was a memorable moment! As our journey came to a close, we had but one destination left on our Viking cruise – the beautiful city of Budapest! Once in the city, we visited the Fisherman’s Bastion for a spectacular panoramic view of the city, the majestic parliament building, the Danube River, the famous Elisabeth and Queen Bridges, and much more. We left the palace grounds for some lunch at Gundel restaurant, renowned for its traditional and elegant Hungarian cuisine, which boast of having served none other than the Queen of England, the Dali Lama, President Clinton and many other famous personages. Following this lovely meal, we spent the rest of the afternoon touring Budapest; enjoyed a walk through the city along the famous Vaci Utca – there are so many things to do…Budapest’s main pedestrian shopping streets, visiting one of many museums or participate in one of two excursion organized by Viking cruises: either taking a bath at one of Budapest’s famous Neoclassical thermal mineral pools, or visiting the Lazzarus equestrian farm for a typical Hungarian horseshow. So much to do with so little time! After a great day in Budapest, it was back on the boat for a final dinner and farewell to our new found friends. Following our delicious five-course meal, we were all invited to join the crew on the boats terrace, for a final cruise of Budapest by night. We were greeted with spectacular views as the boat passes under the famous Elisabeth Bridge, you can see the lit-up parliament building from afar. The sheer magnitude of this building at night takes your breath away – get your camera ready for this memorable sight. What a way to end a trip! was originally constructed in the early 1700’s as a royal palace with ceremonial courts, guests apartments, grand halls and library built in. Today, the abbey is inhabited by Benedictine monks who have been part of the Melk community for more than 900 years. Throughout our visit, we entered rooms filled with treasures kept by the Benedictine over time. There are also two prestigious library rooms each with painted frescoes ceilings. The reader in me longed to linger on and browse through the rare books. The tour ends with a visit in the lovely Abbey’s chapel. hat do passengers really think about their cruise experiences? AllThingsCruise.com asked travellers to review their cruises right after they return, while impressions are still fresh on their minds. Over the past few years, several thousand consumers have done so and this has provided insight as to their favorite ships and cruise lines. “Not only is this information helpful to those who write and report on the industry, but the first-hand reviews give real insight to the onboard experience and are extremely helpful to consumers who are trying to select a ship for their precious vacation time,” says Cynthia Boal Janssens, editor of the website, who sees most of the reviews before they are posted. Travel agents will also find the reviews helpful when recommending ships to their clients. Legends of Thailand FOUR SEASONS HOTEL CASA MEDINA BOGOTA Epitomizing three distinct facets of the Thailand experience, these hotels offer exquisite accommodations, stellar and intuitive personal service, renowned dining, and exceptional spas – legendary destinations in their own right. The Siam is located alongside the iconic Chao Praya River, at the base of Krung Thon Bridge in the historic Dusit district, home to Bangkok’s must-see cultural sights. Hotel guests can take advantage of The Siam's complimentary boat shuttle to a variety of attractions and landmarks including bustling night markets and famous “wats” or temples that dot the riverside. Guests who want to stay on property can enjoy The Siam’s facilities that provide an immersive experience, including a cooking school, a spa, a gym replete with a Mauy Thai boxing ring, and even a mini cinema. The Dhara Dhevi Chiang Mai presents an intimate look at northern Thailand’s tropical countryside, rich with culture and tradition. During their stay, travelers can learn local crafts at the property’s Art & Craft Village through programs such as basket making, bamboo weaving, rice pounding, paper cutting, and flower arranging in northern Thai style, or roll up their sleeves for outdoors experiences that include riding on the back of a water buffalo or rice planting. Andara Resort & Villas is a beautiful boutique hotel nestled amidst lush tropical surroundings overlooking the Andaman Sea on the pristine west coast of Phuket’s Kamala Beach. Boasting breathtaking sea views, private infinity pools, and a range of luxurious accommodation options from elegantly appointed suites to spacious villas, this resort is the perfect choice for travelers seeking a romantic getaway or quality downtime with family and friends. Long the favourite of the city’s power players and an international clientele ranging from rock stars to heads of state, a beloved landmark now begins a new chapter in its storied history with the opening of Four Seasons Hotel Casa Medina Bogotá on October 15, 2015.. Careful restoration of the residential-style hotel has retained the French and Spanish-influenced design details of artist and architect Santiago Medina Mejia’s original 1946 building, while technologies have been fully updated and modern luxuries added for today’s most discerning travellers and local guests. Sixty-two rooms and suites – no two alike - have been beautifully redecorated taking advantage of unique features such as fireplaces or beamed ceilings. Perched above the quaint village of Goreme, The Kelebek Special Cave Hotel offers magnificent views over the village, and to the valleys and mountains beyond. With 47 specially-crafted rooms offer the cave or cave stone experience, helpful & knowledgeable staff, and all the amenities a modern traveller requires. The hotel was the ancestral home of the owner, Mr. Ali Yavuz and started off as a small guesthouse for weary backpackers. Over the decades, with Ali's vision and love for preserving the heritage of Goreme - the Kelebek Hotel has grown into a mix of traditional fairy chimney rooms at the top of rock formations to luxury suites - and many styles in between. With sweeping views over the heart of Cappadocia, a tranquil rose garden, refreshing outdoor swimming pool, luxury spa Hamam and a restaurant serving traditional local menus - the Kelebek Special Hotel in Goreme is the place to relax and enjoy life while exploring all that Cappadocia has to offer. pon arrival, the grandeur of Parisian artistry is on display. Classically designed, the Napoleon Hotel seamlessly blends old world elegance with modern convenience. The lobby is stunning, with regal chandeliers and a décor that recalls Hemingway’s era with small, intimate alcoves and comfortable couches for family vacation planning sessions. name toiletries. As we arrived late, we spent the evening in our room enjoying the Cable TV, Wi-Fi and appreciating the air conditioning! Mornings are a delight in this wonderful palace, and we stuffed ourselves on the rich breakfast buffet filled with a dizzying array of cheeses, cold cuts, breads of all kinds, freshly squeezed juices, the best melons I have ever had, bacon, eggs of any style and perfectly prepared coffee, espresso and cappuccino. The hotel has been lovingly kept this way by the Pavlovich Kliaguine family, whose “An artist has no patriarch built it in the 1920’s as a wedding present to the Parisian girl he home in Europe except in Paris.” fell in love with. that links old and new Paris, standing proud and strong. Another few steps and there is the famous Champs de Elysee, from the Place de la Concorde to the Rond-Point. The Avenue runs through the Jardin des Champs-Élysées, a park containing several landmarks including the Grand Palais and Petit Palais and several restaurants, gardens and monuments. The Champs-Élysées ends at the Arc de Triomphe, built to honour the victories of Napoleon Bonaparte. Another bonus? To explore elsewhere, including the Louvre or Notre Dame Cathedral, the Hotel is next to a Metro station! The days pass by quickly in Paris, and returning to this luxurious haven each evening is great. It was a treat going to a clean room once the day of shopping and discovering the many great Paris sites was complete. The staff is polite, courteous and the room service is prompt and second to none. Researching this hotel online I was also impressed as the after-service, as for every Trip Advisor entry I read had an answer from the hotel! An amazing place to stay for a romantic foray or family getaway! Sweet Dreams are Made of Thisâ&#x20AC;Ś. ’ve traveled extensively around the Caribbean with my adult daughter Jessica, but since she’d never been to Mexico, I decided that it was time she see some of my favourite spots south of the border. And her 28th birthday was looming, so I planned a two-pronged stay throughout the Cancun/Riviera Maya /Tulum region with some exciting adventures along the way. We stayed at two different Dreams brand resorts- both very different in design and vibe-but both familyfriendly all-inclusive. All Dreams resorts feature a trademark Unlimited Luxury ® program which is a comprehensive offering of food, drink, activities and amenities with reservation-free dining and multiple themed restaurants as well as 24/7 room service, pool and beach service and much more. And a bonus is that you don’t have to wear those tacky wristbands! Also a big bonus is that all Dreams Resorts offer free unlimited Wi-Fi and local and international calling through their complimentary Unlimited Connectivity ® program. Basically, everything you can think of is covered. from that balcony tub where spectacular, especially at sunset. Add champagne ( included ) and we really were in waterbaby heaven! Other highlights we enjoyed include the gorgeous lobby bar- the design is incredibly exotic and it overlooks a massive eco-walking trail and features live entertainment at night. We also loved the Pan Asian restaurant Himitsu- one of many themed spots; the Hibachi chef was a fabulous entertainer. But we found the cuisine all around was excellent, even at the beach bars, and the service was always above and beyond. My daughter is vegan, and that can often make dining out at these types of resorts a challenge, but they always went out of their way to ensure she had flavourful and interesting choices even if they weren’t on the menu. Overall, we had a wonderful time, and even though I typically prefer adult-only resorts, this place has lots of escape spots where adults can lounge in peace. the deck that led onto its own swim39 out channel- very cool. And the beach was only a short walk away. Again, the food and service was great all round–but what also stood out for me was how committed this resort was to operating green. They are recipients of numerous eco awards including the prestigious and hard won Certificate of Environmental Quality in Tourism by PROFEPA. www.dreamsresorts.com/ri viera-cancun Awesome Adventures: Soaking up so much sunshine, liquid luxury and gourmet food was rejuvenating and really gave us a chance to reconnect girl’s getaway style, but I also wanted Jessica to see more of the region beyond the resorts. So we also visited Xel-Ha eco-park- a natural wonder where the underground rivers rise up to meet the sea. It is an incredibly beautiful oasis. But though we had an excellent time snorkelling there and trying the cool new zip-line bikes where you pedal your way through the treetops of the rainforest, we didn’t realize just how massive this park was and how much it had to offer. Half a day is nowhere near enough to really explore and enjoy it all, so we will have to return. Visit: www.Xel-Ha.com Amstar DMC is always my very first choice of transfers from the airport, as well as for transportation around Mexico. I also trust them to book the best tours and activities using the most dependable and professional operators available, and they have never disappointed. And their drivers have always been firstrate, professional, on time, and well informed about the region, and their vehicles modern, well maintained, air-conditioned and comfortable. I highly recommend them. A typical day looks something like this: 6:30 – Yoga 7:30 – Breakfast 8:30 – Hiking (lunch on the trails) 3:30 – Return to lodge 4:00 – Stress Management seminar 5:15 – Dinner 6:00 - Spin/cardio class 8:00 – Massage All of this on 1200 calories and no caffeine. So why would anyone choose to spend their hard-earned vacation time here instead of perhaps a beach in the Caribbean? “People say they come because their clothes are too tight,” says Kirkland Shave, program director (weight loss is guaranteed at the resort). But he adds that there is often a ‘tipping point’ in people’s lives that motivates them to come, whether it’s a bad habit they want to break or even a major life event like a divorce. For our group of 12 from the US and Canada, the reasons vary. Half had been here in previous years, and for the majority the reasons were health related. he schedule is not for the faint of heart at Mountain Trek, a weight-loss resort located east of British Columbia’s Okanagan Valley in the Kootenay region. “My diet was unhealthy, and with a history of diabetes in my family I knew I needed to do things differently," says New Yorker Michael Hussy. There was also a litre-a-day diet coke addiction he was looking to kick. breath. She’s not concerned and a few minutes later we’re off again. As much of a workout as it is, the hikes are undoubtedly the highlight of my trip. Most days we spend about four hours on the trails, stopping en route for lunch (which always consists of hearty soup) at lookout points that make the climb up worth every labored step. The Selkirk and Purcell mountain ranges, where we’re climbing, are the Rockies older sibling, formed tens of millions of years before the famous Rockies made their appearance. Their glacier lakes, tree-lined peaks, wildflowers and the glacier themselves make for stunning eye-candy even if we are huffing and puffing up the mountains. We return from our excursions usually around 4pm, which gives us just enough time to have a shower or a quick soak in the hot tub before a seminar. There's at least one lecture a day on topics that range from fitness and nutrition to stress management and integrating the program at home. The information is practical, and although their program while we’re at the lodge is intense, they advocate a much more relaxed and doable plan for at home with a higher calorie count and realistic goals. Dinner is at 5:15, and is always very much anticipated. The food is fresh, delicious and well-presented, and I'm continually amazed by how well we eat. Chef Coral McLean says everything is made from scratch with fresh, local ingredients. "Simple is always best," she says. "And love has to go into it." However, there's not much time to enjoy it as there another exercise class from 6-7. Frankly, this seems a bit too much for my already battered body, but there's infrared sauna, steam rooms and massages to look forward to. If you Go: Mountain Trek offers 1 or 2 week all-inclusive programs for small groups (max. 16 participants) during spring, summer and fall. Shuttlebus service is offered from Castlegar, BC and Spokane, Washington. ndian history dates back to 3000 BC. Excavations in Punjab and Gujarat reveal that the Indus Valley civilisation was a highly developed urban civilisation. In fact the two cities of Harappa and Mohenjodaro, situated on two sides of the river Ravi, are known to have been built on a similar plan. But that only meant a new wave of urbanisation was taking place along the Ganges around 1500 BC. This has been recorded in the Rig Veda â&#x20AC;&#x201C; the earliest known literary source composed in this period that sheds light on India's past. defeated Prithviraj Chauhan, the Tomar ruler of Delhi and left it in charge of his deputy, Qutub-ud-din, the man who built the Qutub Minar in Delhi. His rule was followed by that of the Khilji, Tughlaq, Sayyid and Lodi dynasties. Known as the Sultanate of Delhi, it was during this period that the Muslim rulers introduced Islamic concepts of society and governance to most of the sub-continent, though the South remained largely untouched. and the Chalukyas. Under the various rulers, arts and craft in the South also saw the emergence of various styles of architecture and some of the grandest architectural accomplishments in the South - the most famous being the exquisitely crafted Chola bronzes. These were followed by the Hoysala and the Vijaynagar empires - among the greatest Hindu empires. In 1525, Babur, a descendant of Timur, as well as Genghis Khan invaded Punjab and eventually founded the Mughal empire in India. His rule was followed by that of his son Humayun. Humayun was ousted by Afghan chieftain Sher Shah but resumed power after Sher Shah's death. Sher Shah is, however, remembered as the one to build the Grand Trunk road spanning from Peshawar to Howrah. Humayun's reign was followed up by his son Akbar who actually consolidated power and extended the empire across North India and parts of South India. One of India's wisest rulers and most able administrators, Akbar's reign is considered to be one of the best the country has known. Akbar was succeeded by Jahangir, followed by his son Shah Jahan - best known as the builder of the Taj Mahal, the Red Fort and the Jama Masjid. Shah Jahan's reign was followed by Aurangzeb's. The death of Aurangzeb saw the decline of the Mughal rule in India. ary changes in the social, political and the economic life of the country. Towards Independence The disintegration of the Mughal empire, fighting among the Maratha rulers and inability of the various rulers across the country to unite against a common enemy saw the British consolidate their position in the country. However, the 19th century saw a revival of national pride and social reform and the Indians began to tire of the suppressive British rule. Things reached a flash point in the second half of the 19th century when the first war of independence in 1857 broke out in Meerut. It was sparked off by the introduction of a new rifle and cartridge by the British in the Army. The cartridges which soldiers had to bite off, allegedly contained pork and beef tallow, which offended the religious sentiments of both Hindus and Muslims. The soldiers rebelled, reached Delhi and proclaimed Bahadurshah Zafar the sovereign ruler of India. They were eventually overpowered by the British. But there was no looking back for the Indians who wanted social reform and freedom. The Indian National Congress was set up and educated Indians started formulating strategies to assert their birthright to independence. Gandhiâ&#x20AC;&#x2122;s Arrival The anti-British sentiment became a mass movement with the arrival of Mohandas Karamchand Gandhi who devised a unique strategy for India's freedom struggle based on non-violence and civil disobedience. He conceived and led the non-cooperation movement in 1922, the Salt Satyagraha in 1930 and the Quit India Movement in 1942. All of which pushed the British into agreeing to transfer power on August 15, 1947, the day that is now celebrated as India's Independence Day. Today, India is the world's largest democracy with a federal form of government. Frolicking in Florida at Christmastime! Does anyone do Christmas better than Disney? I think not! Happy Holidays in Hollywood! Hollywood Studios is one of my favorite Disney destinations to visit and I never miss a chance to go when I can. Everywhere you look there are special touches. Stores with decorations, Christmas wreaths and the Terminator statue with a Santa hat make the moniker Tinsel Town take on a whole new meaning! As in most parks, a visitor must plan the day out in order to maximize the experience. Whenever here, and my son whole-heartedly agrees, the first stop must be Star Tours, the Star Wars themed ride. We visited years ago and were pleased to find out that the ride has been updated and revamped and boy I love that ride! It has all a fan could ask for – Darth Vader, spaceship battles, and C3P0 as a guide! Exiting the ride, visitors are greeted by a vast array of Star Wars merchandise, including build-your-own lightsaber and droid stations, along with action figures, Disney-only toys and other goodies. Our next stop was the Muppet Theatre. to 60 mph in 3 seconds! I like two places on a roller coaster, the front seat or the very back of the train. We were lucky enough to get the last row for this unique ride. The blast off is all that it is rumored to be, and you better be ready for it! The Tower Of Terror was being built the last time I was here, so it was a treat to see the final product! The mood is set by the decrepit hotel halls passengers walk through to get to the elevator…to Terror! Sitting in rows, the elevator goes up in jolts, and then falls quickly at least 10 stories at once. The freefall sensation is amazing and with the elevator goes up and down several times, it is a blast! room of the ‘Inn’ where a small stage is set with various furniture representing an inn. We are introduced to the main characters during a set performance piece with some crowd participation improv thrown in here and there. The Splash Mountain ride was another hit, the slow, long, twisty ride through caves filled with great animatronics, as was the age-old favorite Pirates of the Carribean, though my daughter did ask where was Elizabeth, Jack Sparrow and Will? The fun begins as dinner is served and the Constable introduces the murder investigation. The show was very funny, and the actor playing the Constable was incredible. He cross-dressed for the character and was definitely the star of the show. The cast was talented enough to keep up with him for most of the night, and the show was a great success – so great that only 25% of the crowd guessed the murderer! Funny enough, my favorite time was climbing aboard the steam train that runs on recycled oil and waste and is a great way to see Disney World. Talk about Spectacular! Our visit was great, and quite different from years ago when our kids were young. This time around the kids were old enough to enjoy the bigger rides, and we started with one of my favourites, Mission: Space! The show is silly and there is a lot of laugh out loud moments – it is a show that you make of it what you put into it! In this show, my son was chosen to be the Constable’s assistant, placed in charge of evidence and brought on stage a few times. A thrill for the whole family! I highly recommend this great family-friendly show! Magic Kingdom Well, the crowds were something else at the height of Christmas, but true to Disney form, the crowd management is phenomenal and the day went quite smoothly. Of all the parks, it is the Magic Kingdom where Christmas truly comes to life! Throughout the park, the signs of the season are in evidence. Christmas trees, tinsel and the colors of Christmas are everywhere. Even the main characters of Disney are in the mood to celebrate, with Pluto in Santa red and Goofy dressed as Santa himself! Mickey and Minnie are decked in their finest as well, as evidenced during the daily parades down Main Street. Medieval Times Dinner Theatre And so, ‘twas our Knight that doth won the night! I have wanted to see the Medieval Times show since I lived in Toronto in the early 1990s, and the wait was worth it! From the moment you arrive, if you let yourself, you can be swept back through time to the Dark Ages, walking through the Medieval village that has been built. Through the kitchen and into the black-smithy, past the stables and into the museum of torture tools! Real world collides with commerce as you enter the main building, as there are many counters with merchandise ranging from 50 cent flags to 200 dollar dresses and thousand dollar swords. Needless to say I wanted a sword, but had to settle for a $30 foam replica… Dinner is announced by trumpet and the stalls around the arena-sized field theatre fill quickly guided by the well-trained staff. The arena feels like a hockey rink! Huge and oval, the entrance of the knights is something to behold! As they enter, the Medieval Meal is served. A great twist is that there are no utensils, so patrons devour the meals with their hands. Chicken and ribs with an apple turnover and garlic bread…Truly ‘twas fare for the masses! And the best part? Our section’s knight won the tournament! This great ride offers riders the sensation of a blastoff, flight and awkward landing on Mars. It can be claustrophobic, as you are placed into a small flight capsule then spun and bumped around as you launch into space. My kids loved it, and so did I! The best ride at Epcot has to be the Chevrolet Test Track. Revamped and beefed up over the last few years, this one-of-a-kind crazy thrill ride! Sitting in a convertible, you test various road conditions, climbing power, brake reactions, hot and cold conditions until the vehicle bursts outside onto a race course, where it reaches an exhilarating 100 miles an hour! After, you can continue the handson exhibits with you in a commercial and interactive car design activity. Spaceship Earth is another classic Disney animatronics ride with a time-travelling theme and a spectacular climax - a starscape that will impress even a jaded CGI fan. The kids enjoyed the “Future You” segment, where you pick your future sports, clothes and job – fun stuff. The rides and attractions kept us busy until the fireworks started. Now I have seen fireworks on Canada Day across Canada, during the Symphony of Fire and I can honestly say that the New Years Eve fireworks display at Epcot is something to behold! Disney still has the magic, for sure! We knew our targets in advance so we could navigate the crowds to get to them. It may be an old standard, but Magic Mountain was the number one ride on our list. The speed and lightshow through the darkened rail route is still exciting and thrilling! Always a great ride.